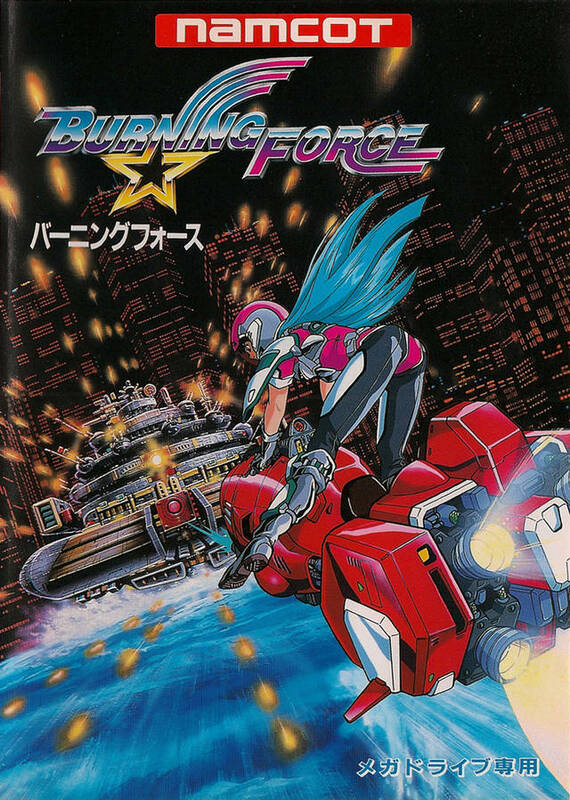 Burning Force is Namco’s second contribution to the Mega Drive/Genesis, and there’s no question that it’s superior to the first. Phelios won brownie points for its Greek setting, but with limited power-ups and an oversized protagonist sprite that absorbed any projectiles launched at him, the game was an inspired misfire at best. 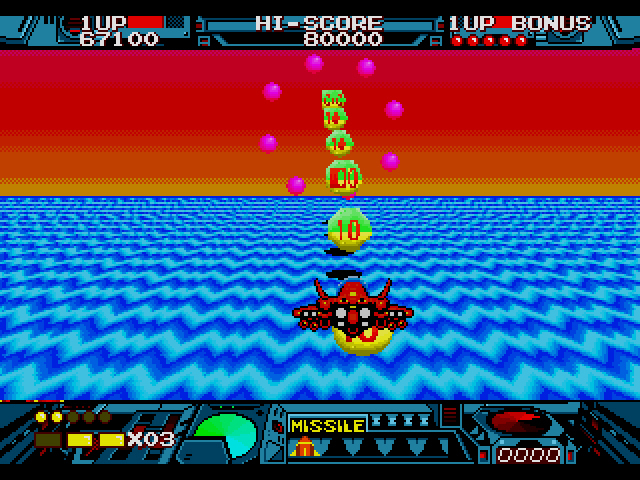 Burning Force is Namco’s attempt at Space Harrier, and while the 3D perspective isn’t as jaw-dropping as it was in 1986, the game improves on the formula by disposing of vertical mobility. Even the ocean doesn’t want the Death Star’s remains. 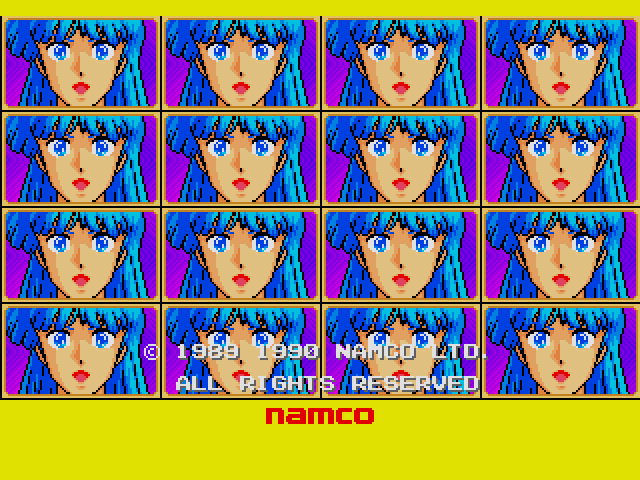 You play as Hiromi Tengenji, a fresh, young space cadet of Earth University. Before she can graduate and make a name for herself, she must complete a lengthy training course to prove her mettle. Over a six day span, Hiromi will travel through desert, oceans, the mountainside, and various alien landscapes atop her trusty airbike, the mysteriously named Sign Duck. Enemies both great and small will try and sabotage her future prospects. Only the Burning Force within will help her emerge triumphant. Prince’s band tryouts were just weird back in the day. Each of the game’s six days takes place in a different environment and are divided up into four areas. The first two areas are combat zones, filled with miscellaneous enemies that emerge from every direction possible, along with a miniboss fight at the end. 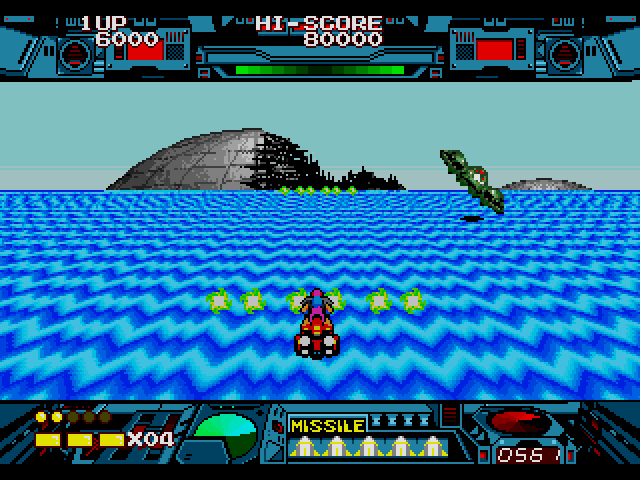 Before you begin the third area, you’re scooped up into a large plane where your airbike transforms into a standard red ship. 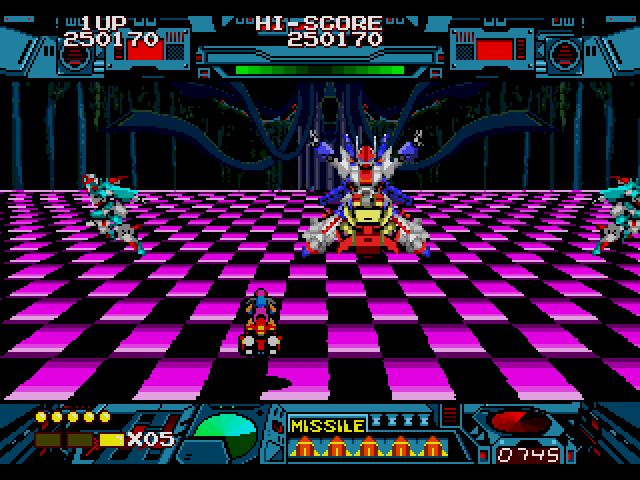 The third area has some combat, but mostly focuses on the final boss of the area. Finally, the fourth area is a bonus stage where you collect bubbles for bonus points and a potential extra life. “These bingo balls are mine!” Hiromi cackled. The combat is straight up Space Harrier, sans the latter’s awkward field of vision. By excising vertical mobility in the first two areas, Hiromi and her airbike are planted firmly on the ground, only able to speed up and move horizontally across the bottom of the screen. This doesn’t make the game easy, mind you, but it does mean that you can see all upcoming obstacles and enemy projectiles from anywhere on screen. In the third and fourth area, the ship gives you the ability to move in any direction, but because it doesn’t block a large portion of the screen, the free range of movement is more tolerable. Fire towers on either side? No big deal. Power-up bubbles occasionally pop-up throughout the level and increase your attack power. Wave extends your default two-projectile blast into a horizontal six-projectile monster, and is by far the best. The Cross Laser doesn’t fire as quickly as the Wave or your default, but has a decent range. The Laser is strong, but only fires directly in front of you. You also have two kinds of missiles, Max and Homing. Max missiles explode outward once launched, but they never appear to do any damage. Homing always hit their target. That little commander means business. 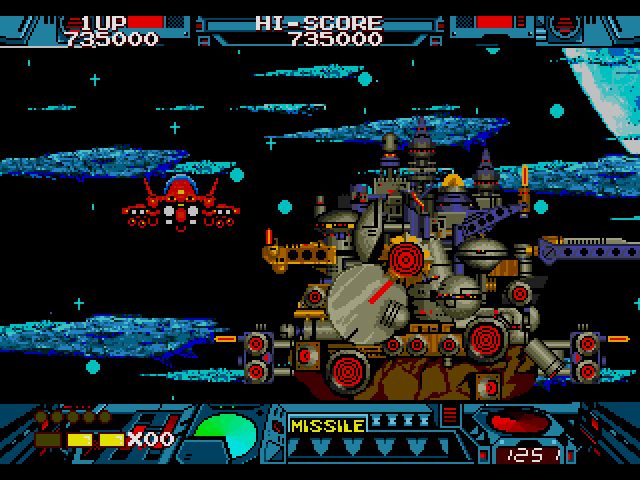 Despite the improved combat, Burning Force‘s style isn’t as memorable as Space Harrier‘s. The stages are comprised of flat terrain (by necessity – Hiromi’s Sign Duck just can’t fly), mixed usually with some looming mountain or obelisk in the background. Enemy design is nondescript and ranges from ships, to stationary objects that spew projectiles, to robots. Some of the bosses, like the large mech that launches two smaller mechs from its side, and the Floating City are well-crafted, but they’re few and far between. Why be enemies when you can dance the night away? Even if the generic style leaves something to be desired, the soundtrack by Yoshinori Kawamoto is chock full of late 80s bangers. The “Boss Theme”‘s driving drums and propulsive synths get you hyped for the battle, while “Sarinuka Sands” is pure metal. The arcade game is considerably harder than the Genesis port. 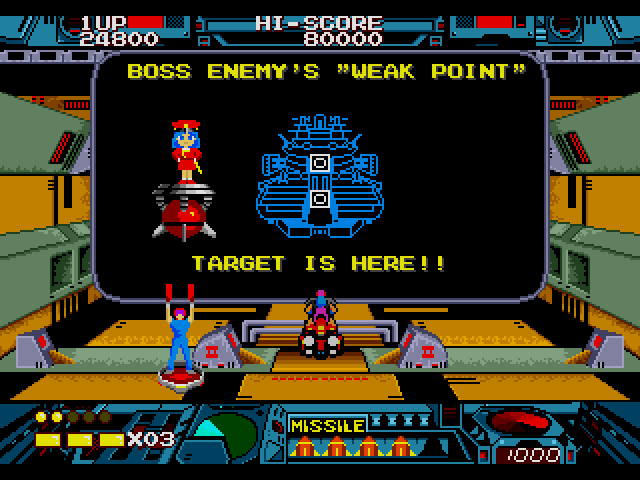 There are more enemies in the arcade version, and you’re only able to get hit once instead of three times. The Genesis port also allows you to switch between ‘Easy’ and ‘Hard’ difficulties, and boost your lives up from ‘3’ to ‘5.’ No continues in the Genesis port, though. Namco’s not that generous. Oh Floating City, I’d live in you if you weren’t such a jerk. Burning Force doesn’t push the Space Harrier formula forward, but it does streamline it for casual consumption. No more cheap hits, thanks to a protagonist that doesn’t block your view. No one-hit kills, at least in the Genesis port. Admittedly, the game certainly isn’t as epic as Space Harrier, but at least I can see everything that’s happening on-screen. I know I know I’m in the minority here, but for me, Burning Force is the definitive Space Harrier experience. “Earth University,” huh? I wonder what the sports team is called? Better than Space Harrier? I wouldn’t go that far, but it is a fun little game. It controls great and it looks nice. It just didn’t seem very inventive to me. I don’t expect anyone to agree with me, and I’m comfortable with that. It’s a shame that it’ll be years before you play Panorama Cotton and can tell us whether you still prefer Burning Force. It’s got a smaller protagonist than Space Harrier, and more visual style than Burning Force, but the real magic is actual sprite scaling on a humble Megadrive. The music is catchy, the game play is fun, and that cover art is awesome. This is another one I had as a kid, and man am I glad to have had it. I’m pretty impressed with the scaling on this one. The sprites and play area are smaller than the likes of Space Harrier 2 and After Burner 2 but I would say the scaling is smoother as a result. 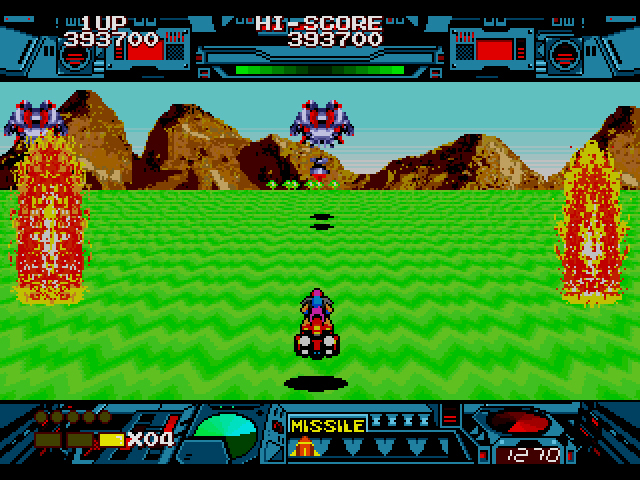 Although I cannot escape the feeling whilst playing Burning Force that I would much rather be playing Space Harrier. No continues in the Genesis port?! My copy has 3 continues (aka “credits”) per play, and there is a game genie code for infinite credits too. Were there multiple revisions of this game maybe? Fun game. Not super memorable, but a fun time. I like how when you take a hit, she kinda stops and bounces a little. And when you blow up/lose a life, she flips up into the air into a somersault and comes back down onto the regenerated air bike. Nice touch. Hmm… good question. Haven’t seen anything about the game having multiple revisions, but you never know! Agreed about the little details. I love when she flips in the air, then lands on the new air bike. Yeah the version I played had 3 continues as well. I was playing the European version perhaps there were no continues in the NA release ? I forgot to mention that I also think this game is more fun to play than Space Harrier. Just my personal preference, and I don’t think either game is all that great, but if I had to choose one over the other, I’d play Burning Force 9 out of 10 times. It’s just great to know that I’m not the only one who feels that way.